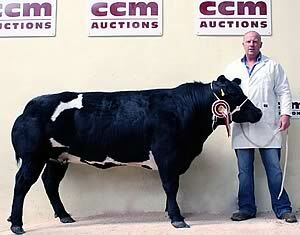 Richard Seed with his pedigree British Blue bull champion. Richard, who trades as R Seed & Son at Parsonage Farm, Chipping, Preston, saw his first prize-winning 2009-born bull Parsonage Eric progress to become supreme champion at Skipton’s opening 2011 pedigree beef season fixture, courtesy of local judge John Stephenson, Bordley Green. Eric is a son of Blue Stone Union Jack and a full brother to the Seeds’ 2010 victor, both being out of the home-bred cow Parsonage Apple Pip. The same dam was also responsible for a second Seed bull that headed the prices last year on what was their first appearance in the Skipton show arena. The reserve champion was the first prize female from North Craven’s Richard Maudsley, of HR & WJ Maudsley, Rathmell, Settle. Also new to the show ring, the June, 2009-born daughter of the AI sire Dafydd D’Ochain, out of Woodview Wanda, owned by fellow North Craven breeders Jack and Rebecca Wallbank, of Keasden, Clapham, made 1,500gns (£1,575) when joining Dales farmer James Middleton, Arncliffe. 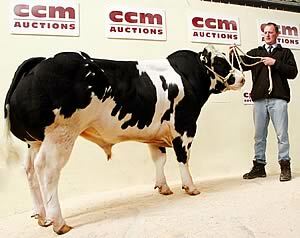 Richard Maudsley with his reserve champion female. The class-winning 2008-born bull, Bringlee Dominic, was exhibited by George Stapleton, of GK & JW Stapleton, High Skibeden Farm, Skipton. By Bringley Waldo, out of Bringlee Wanova, both bred by Graham Brindley, of Market Drayton, Shropshire, he sold for 2,050gns (£2,152) to J S Garthwaite, Wakefield. Mark and Elaine Hartley, of Pendle View Farm, Roughlee, Nelson, achieved two notable sales successes on what was their first-ever visit to the Skipton British Blue fixture. Their third prize 2009-born bull realised 2,800gns (£2,940) when joining William and Mark Keighley, Leathley, Otley, while a second bull was knocked down for 2,600gns (£2,730) to D Leeming Ltd, Burnt Yates, Harrogate. Skipton’s 2011 pedigree beef season continues with the annual Limousin highlight - this year a double-header for the first time, with the Northern Limousin Extravaganza on Tuesday, May 10, and the annual show and sale of pedigree breeding bulls and females on Wednesday. The season culminates on Wednesday, May 26, with the Lingfields Beef Cattle Fair, featuring the annual multi-breed show and sale of pedigree beef breeding cattle and Spring breeding bulls. Entries close on Monday, May 9.